Parents of specials needs children are exhausted. They've done all the research, consulted all the experts, joined support groups, gotten counseling, fought for the best life for their children. Often just caring for their children's needs and attempting to maintain a home maxes out parents' mental, emotional, and spiritual reserves. As a single mom to a special needs kiddo, I've found myself sometimes feeling buried under his needs. Please don't get me wrong. I don't resent it for a single moment. My grieving time for not having a "normal" child is long past and I love this kid with everything I have and I am as insanely proud of him and his accomplishments as I am his younger brother. What I mean is that while making myself available to him 24/7/365 and dealing with his special needs (such as I tutor him every single night for hours), I've lost myself in the process. I stopped dreaming or even thinking that I could have dreams. This book made me smile from the moment that I started reading it. Laurie gets it. Every single page seemed to have something that I could relate to. Some of it I've dealt with, some of it I'm still dealing with. 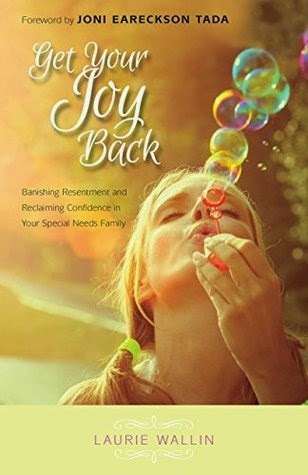 This book isn't about how to handle your child's needs or to find the perfect specialist. It's about finding yourself, forgiveness and finding joy in the journey again. She encourages us to dream and that we deserve to dream. Will you find joy after reading this book? I don't know but I do know that it will remind you that you are not alone and sometimes just having that reminder can make a huge difference.